So you’ve decided to become a vinyl DJ. What next? Well, now you have to decide what gear you need. There are a huge variety of models and brands to choose from, so no matter what your budget is, you’ll be able to find something to get you started. However, there are a number of items that you will need to acquire, regardless of what brand they are or how much they cost (being a DJ can cost quite a bit if you like spending money!). But what do you really need to buy before you get your gig on? 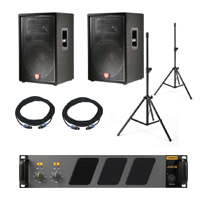 If you have some extra cash to spend, you might want to consider getting a PA System. Right, there’s the shopping list. But if you don’t have unlimited funds to spend on all this, then you should make sure that the vast majority of your budget goes on the turntables themselves. A bad set of decks won’t sound good through a super hi-end mixer, but if you get a basic (even second-hand) mixer you’ll sound much sharper with decent DJ decks going into it. You can always upgrade your mixer quite easily once you start seeing your earnings start to grow – and it can be much easier to get used to a new mixer than feeling out the response of a new set of decks. This is a job where split-second timing is crucial; being completely familiar with the behaviour of your turntables is what makes the performance flow. Get a direct drive turntable. Ok, with that out of the way (again), let’s see what else we need to keep an eye on.